We produce and supply construction machinery throughout the world which is actively used in various fields, including hydraulic excavators and dump trucks. Hydraulic excavators and other types of construction machinery are indispensable to areas that support the foundations of industry, such as infrastructure construction and mining development. 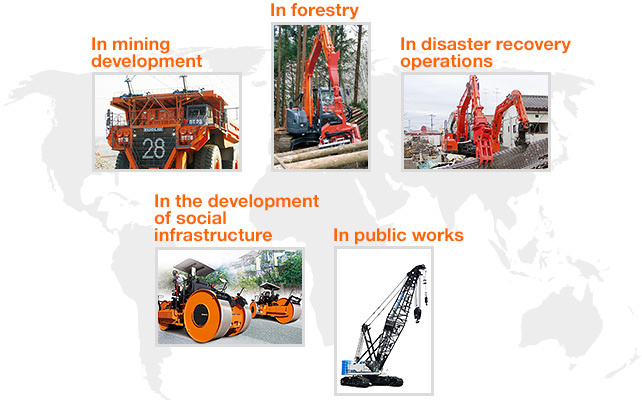 As a total supplier of construction machinery, the Hitachi Construction Machinery Group plays an active role in all areas of society, from civil engineering and construction, to the environment, recycling, mining, forestry, stockbreeding and farming. The construction machinery business is not one that ends with a sale – that’s where it begins. 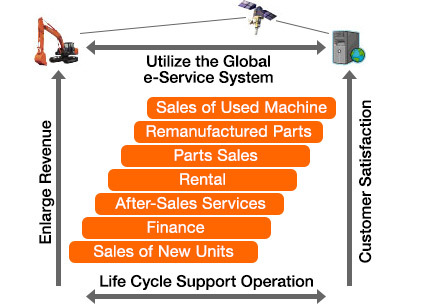 The Hitachi Construction Machinery Group will expand “support for the entire life cycle of products,” from the sale of new machines, through to the supply of parts, repair services and the sale of used machines. Through close communication with customers, the Group will link improvements in customer satisfaction to the creation of new business opportunities.